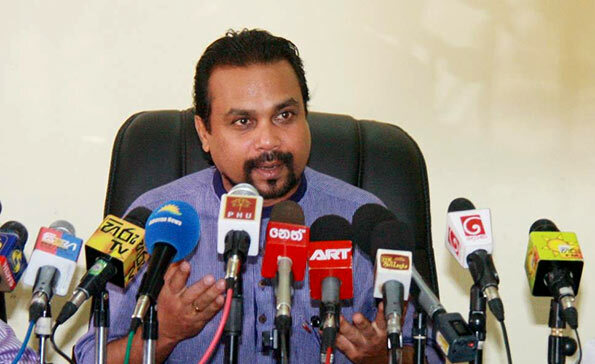 The National Freedom Front (NFF) headed by MP Wimal Weerawansa will be contesting the upcoming local government elections from a newly formed political front. He said the country was moving towards anarchy due to the manner in which the government was behaving. “We can observe that the Maithri-Ranil coalition is dragging our country along an uncertain track where peace and its unitary status are not protected. This was made clear by the speech delivered by Prime Minister Ranil Wickremesinghe during the Thai-Pongal National Ceremony held in Jaffna, in the presence of former president Chandrika Kumaratunga. He had said that he would work to abolish the Prevention of Terrorism Act in the coming months. This can be a huge threat to national security,” he said. Mr. Weerawansa alleged that the prime minister’s move to abolish the PTA (Prevention of Terrorism Act) was a result of a promise made by the government to the Human Rights Commissioner in Geneva, adding that the country had become a puppet of what he called ‘international influences’. Meanwhile, he stressed that before bringing in an Act of Parliament to control of the activities of Buddhist monks, the government should seek the approval of the Tri Nikayas’ Sanga Nayaka Theros. for the fact the grand coalition just as perverted or more so that they cannot move forward. You guys ought to get nominated to the bribery commission to provide evidence or at least to claim that you saw. Wimal Weerawansa planning to become the 3rd force in SL politics? Oh No, with his ex-boss and clan planning their own political party, the voter is bound to be confused. However, cannot imagine a Weerawansa party lead Government in SL ! The School Milk programme will be augmented with Creme Puffs because that’s what kept the hero alive when he was on hunger strike to death. Wonder what role that lean and handsome muslim guy (who sits behind WW all the time)will have in a WW Gov? That lean and handsome muslim guy can turn the hearts of many Sinhala -Buddhist damsels and win many votes too ! !